What do Toni Braxton, Selena Gomez, Lady Gaga and Trick Daddy all have in common? Lupus. How do you get lupus? Lupus, or systemic lupus erythematosus, is a disease of chronic inflammation that can affect any part of your body, including the joints, skin, hair, heart, brain, and the kidneys. Lupus is an autoimmune disease, which means that instead of your immune system fighting the germs, the bacteria, and viruses of the outside world, your immune system turns against you and begins to attack your own organs. Lupus is an autoimmune disorder. This is one of the most common questions when it comes to lupus. "How do you get lupus?" The precise cause of lupus is not known, but we do know that it's a combination of genetic, hormonal, and environmental factors. If you have lupus, then it is likely that you have a relative with lupus. The award-winning singer, Lady Gaga, has tested positive for lupus, and she has shared that she had an aunt who died of lupus. 1.5 million Americans have lupus, and lupus is more common among Blacks, Hispanics, and Asians than in Caucasians. Lupus is also more common among women than in men, and it is usually diagnosed between the ages of 15 and 44. That being said, if you are a man, you could still have the diagnosis of lupus. In fact, the actor, comedian, and producer, Nick Cannon, has shared that he is living with lupus. Now, this is a tricky question. Since lupus can literally affect any part of the body, the symptoms can be vast and nonspecific. Lupus can literally cause pain, inflammation, swelling, and damage to any organ system. Symptoms can be mild or they can be severe and life-threatening. Symptoms can wax and wane. They can come and go. 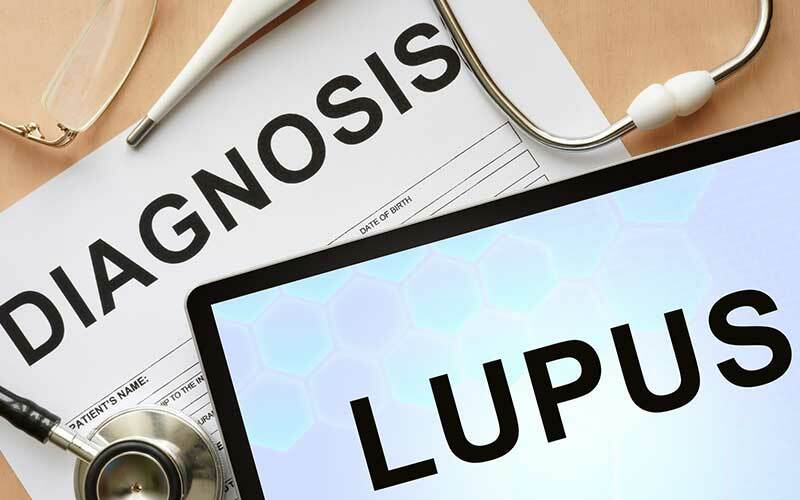 However, most people with a diagnosis of lupus do experience the following generalized symptoms at some point during the course of the disease. This is the most common generalized symptom of lupus, and it can be quite debilitating. Imagine having very low or no energy. It can make it difficult to take on daily tasks of living, or difficult to hold down a job, to go to school. Another symptom, unintentional weight changes. Patients with a diagnosis of lupus can have an unintentional weight loss or an unintentional weight gain. The weight gain often happens when the kidneys are involved with lupus. Patients will hold onto excess salt and water, which will make them put on weight. Weight gain can also happen as a result of treatment, especially if lupus patients are being treated with steroids, which tend to cause you to gain weight. Fever is the third generalized symptom that most patients with lupus will experience. The other symptoms of lupus really depend on which organs are being affected at that time. Lupus patients can also lose patches of hair due to alopecia. Most patients will experience skin changes due to lupus during the course of the disease. The butterfly rash or the malar rash is the most common skin change. It occurs when there is a reddish rash on the cheeks and on the nose of patients, which usually occurs after sun exposure. Discoid lesions can also happen on the skin in lupus. The discoid rash consists of circular raised patchy-like lesions which tend to cause scarring. The rapper and producer Trick Daddy has shared that he has discoid lupus. Patients with lupus can also experience a light sensitivity. When they are exposed to sun or UVA and UVB radiation, they tend to break out in a rash, and fair skinned patients are more likely to have a more severe reaction than darker skinned patients. Almost all patients with lupus will experience joint pain, swelling, and inflammation at some points during the disease. Any joint in the body can be affected by lupus, but some of the more commonly-affected joints include the wrists, fingers, and knees. Lupus can cause a lupus-induced kidney disease or lupus nephritis. Lupus nephritis actually accounts for a large amount of the young Black and Hispanic female patients I see in my practice with kidney disease. When lupus attacks the kidneys, it affects that filtering system, because the kidneys are responsible for filtering out your body's excess water, excess wastes, and excess toxins, so when lupus causes an inflammation in this system, you get a leakage of protein or blood in the urine. Selena Gomez has lupus nephritis. Lupus can ultimately cause a scarring of the kidney, which can lead to kidney failure and the need for dialysis or transplant. The actress and singer, Selena Gomez, has shared that she has lupus nephritis. Selena has now had a kidney transplant. Lupus can affect the lungs. It can cause a shortness of breath due to a collection of fluid around the lungs, or a pleural effusion. It can also cause shortness of breath due to inflammation within the lungs, by causing pneumonitis. Lupus can also cause pain with breathing. Lupus can cause an inflammation around the heart, which can lead to chest pain and shortness of breath. This condition is called lupus pericarditis. The Grammy Award-winning singer, Toni Braxton, has been very open about her diagnosis of lupus, and she has shared that she has suffered from lupus pericarditis in the past. Lupus can affect the brain and the nervous system. It can actually cause an inflammation of the brain called lupus cerebritis, and it can attack the nervous system, causing all kinds of neurological symptoms. Lupus can cause seizures, depression, memory loss, weakness, numbness. I even have a patient who had a stroke due to lupus, at a very young age. I've touched on several organ systems, but remember, lupus can affect any part of your body, including the eyes, the thyroid, the gastrointestinal system, you name it. How can you be diagnosed with lupus? If you have any of the symptoms that I described, especially the joint and the skin symptoms, then it is possible that you could have lupus, especially if you have a family history. In order to be diagnosed, you need to see your physician. Your physician will do a detailed history and physical, and if the index of suspicion is high that you may have lupus, then a blood test will be ordered, called an ANA, antinuclear antibody, as well as a double-stranded DNA. If indeed you do have a diagnosis of lupus after a series of tests, then you should be referred to a rheumatologist to ensure that you have the proper treatment for lupus. This ends my overview of lupus including one of the questions that we hear so often, how do you get lupus? I hope this was helpful. As always, I want you to strive to live your healthiest, happiest life. Feel free to leave me a comment about your experience with lupus.